A collection of my Favorite Summer Soup Recipes, from gazpacho to chowder to fresh-vegetable soups, served chilled or warm, all light and refreshing. So may we please stop talking about the weather? Yes, it's hades hot. Yes, the grass is brown. (The upside? No mowing.) Yes, the herbs are fading. (The upside? Basil loves heat, pesto madness to come!) Yes, there is serious devastation to crops and livestock. (The upside? Um, well, not that I can think of.) But let's just soldier on, muddle through, Hoosier along and get on with it. What other choice do we have? Besides, dinner we can handle and a little soup will help. Not the heavy soups of winter but the special summer soups, lighter, livelier, full of life and promise. Like chilled gazpacho. Like warm summer chowder. Like simple fresh-vegetable soups. It was gazpacho – served cold at a conference in the dank basement of a Kansas City hotel on a wet and windy November day – which turned me into a seasonal eater. But on a hot summer's day, when all you want to do is snooze stretched out on a hammock, nothing invigorates like gazpacho. So wipe the sweat off that brow and get on with life, heat or not. The most traditional gazpacho recipe is the Tomato Gazpacho. It is wonderful but a bit of a production. The Cantaloupe-Tomato Gazpacho blends two favorite summer fruits, melon and tomato. The "green one" (no question which one is meant there, eh? it's called Fruity Gazpacho) is absolutely gorgeous and yes, it really is that bright green color. I serve it as a starter, as a main course and even as a dessert. For an amazing history of and collection of authentic Spanish gazpacho recipes, I turn to My Kitchen in Spain by Janet Mendel. Ah! She has a blog too, also called My Kitchen in Spain, I've just subscribed! Chowders are the soups where vegetables and often seafood swim in a milky base – the tomato-based New England clam chowder is an exception, not the rule. Summer chowders, at least my recipes, are lighter than the usual thick 'n' heavy glops of chowder. The lighter broth is almost silky, especially when there's a little corn to sweeten the milk. I've been making Finnish Summer Soup since I lived in Finland as an exchange student, it's one of a handful of recipes I still make, all these years later. It showcases the best of our first summer vegetables, extra good for CSA members, I think. With shrimp and scallops, Summer Seafood Chowder adds protein but loses none of the showcase for perfect summer vegetables. Corn Chowder is on the re-make list this month, it's best made a day ahead. The Summer of 2012 is breaking all kinds of heat records in North America. But the thermometer is breaking record lows in other parts of the world, in Amsterdam and London, say. Brrr! So my collection of summer soup recipes accounts for cooler days too, with soups that are AC/DC and can be served either warm or cold. Please take a special look at that Sweet-Corn Soup with Shrimp, it's a real winner and doesn't get enough love on this site. It's unusual – but not weird, if you know what I mean. I really want others to love it as much as I do! Vichyssoise sounds "fishy" to me but it's not, it's made from potatoes and leeks, it's extraordinary. When the first butternut squashes come in (and isn't everything so early this year? ), it's too hot to start roasting them so Butternut Squash Soup with Mango & Toasted Coconut is a great way to take advantage of those pretty little butternuts, now not later. Those first zucchini off the vine are so sweet and welcome, no bigger than large fingers, many of them. And then the baseball bats arrive ... so our summer arsenal of recipes must include a collection of recipes that move past the familiar uses, you know, like summer soup! There's no reason to serve summer soups in big bowls, in fact, I have two or three ways to serve soup in small volumes, as a starter say, or alongside a sandwich or salad. Most come from thrift stores! and hold between a half cup and a cup of soup. Garnishing is easy, just a little bit of vegetable held aside or some fresh herbs. Winter food can be, well, kinda "brown". 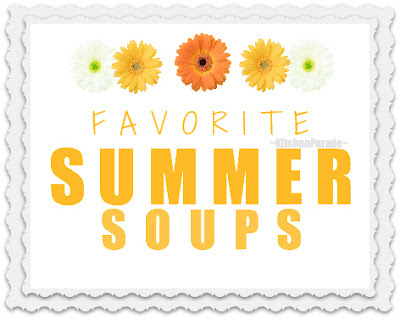 But not these summer soups! Summer's food moves up the rainbow and back down again. One of the greatest joys of summer is its color, indoors and out, on our plates and in our bowls. Sweet with a kick, Chilled Carrot Soup with Honey is really that orange, really it is! Summer's Tomato Soup is made with fresh tomatoes, it couldn't be more different than the wintry versions. Summer Borschtis a marvel of beet and cucumber in a light milky broth, gorgeous color! Kitchen Parade is written by second-generation food columnist Alanna Kellogg and features fresh, seasonal dishes for every-day healthful eating and occasional indulgences. Do you have a favorite summer salad recipe that other Kitchen Parade readers might like? Just send me a quick e-mail via recipes@kitchen-parade.com. If you like Kitchen Parade, you're sure to like my food blog about vegetable recipes, too, A Veggie Venture. "Like" Kitchen Parade on Facebook! To read comments from other readers, please scroll down. A Veggie Venture is home of "veggie evangelist" Alanna Kellogg and the famous asparagus-to-zucchini Alphabet of Vegetables. Hello from cool and rainy London. Today wasn't bad though because the sun was out. I don't envy you your record breaking heatwave. It sounds miserable. All the soups look good and I will start experimenting. I have loved gazpacho from when I first had it in Spain. The white one is also delicious, and served with grapes. Looking for fresh and seasonal recipes for healthy everyday eating and occasional indulgences? Kitchen Parade is my personal collection of 600+ real-food, family-tested recipes. I'm so glad you're here! Leftover Ham? Leftover Easter Eggs? How Ripe Should Bananas Be for Baking? Should Cooked Pork Be Pink? Yes and No. Ripe Bananas for Baking: How Ripe Should Bananas Be? Kitchen Parade & Weight Watchers Freestyle: What a Match! Template by Blogger Templates Builder.